When Does it Make Sense to Rent a Home Instead of Buy? Home / Personal Finance / When Does it Make Sense to Rent a Home Instead of Buy? For years, the idea of the American Dream has been homeownership. That particular dream, though, is fading a bit. After the last economic crisis and real estate crash, many people are rethinking the idea of buying a home. For some consumers, it just makes more sense to rent. One of the first questions that you have to ask yourself before you buy relates to mortgage affordability. Even with home prices and mortgage rates dropping, mortgages aren’t affordable for everyone. As many consumers discovered to their chagrin, they couldn’t actually afford some of the mortgages they got. Before deciding to buy, consider how much it costs, and also consider what you pay over time. In some cases, buying is much more expensive even over the long run – even with tax deductions – than renting. Some consumers prefer to invest the difference at higher returns. What type of lifestyle to you live? What type of lifestyle do you live? If you move frequently, it might not make as much sense to buy a home. If you know that you will be leaving in a couple of years, buying could end up trapping you in the home. If the market is bad when you try to sell, you could end up losing a great deal of money, and have a hard time selling to boot. Increasingly, people are beginning to experiment with other lifestyles. Tying yourself down to one location through the purchase of a house might not fit with your desired lifestyle. Really think about what you hope to accomplish with your lifestyle and how you want to live. If you aren’t going to be staying in one place, and you aren’t interested in owning and managing rental income properties, buying might not be the best choice for you. Before you make a decision to rent or buy, consider what you hope to accomplish in the long term. While many people like the idea of owning a home and being able to do whatever they want with it, the reality is that you are still tying up a lot of capital and wealth in your home. You also need to think about the total cost of the home over time. Your mortgage interest tax deduction (if you itemize) won’t come close to completely offsetting what you pay over time. On top of that, there are maintenance and repair costs, as well as utility costs and other expenses that come with homeownership. Your lower housing costs might mean that you have more available money to live your desired lifestyle right now, including eating out more or buying what you want. And it might also mean that you have more freedom to just up and leave if you want. Really think about your expectations and goals. And think about your financial situation. Remember, too, that homes don’t always appreciate in value. While, from an emotional and sentimental standpoint, I love the house that my husband and I bought five years ago, sometimes I wonder about renting. If we sold right now, we’d be out nearly $20,000 because of the current market. I don’t regret buying since we’ll be here for a while, but it’s easy to see how renting might have been a better choice in a different circumstance. The rules are changing, and your lifestyle preferences are your own. Don’t assume you have to buy to be “smart” or to be happy. It might work better for you to rent. 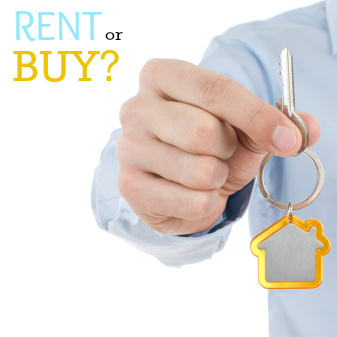 Are you thinking about renting or buying your next home? Leave a comment! This article was originally published on November 12, 2012. 3 Responses to When Does it Make Sense to Rent a Home Instead of Buy? I would like to suggest that one should consider the location. I live in the wealthiest county in my state. We have a mortgage and our monthly house payment is $680/mo. That is for a 4 bedroom, 3 1/2 bath, two story on a large lot. I am within two miles of a SuperTarget, Wal-mart, Grocery store, JoAnnes, Hobby Lobby, Michael’s, DSW, J Alexanders, Famous Dave’s, Bed Bath and Beyond, etc. If necessary I could walk to any of these and frequently do! I was talking to someone the other day about apartment rental and they were asking twice my monthly house payment for a 2 bedroom. So it definitely pays to run the numbers and check prices!